The San Diego County Sheriff's Department is cracking down on people who don't wear their seat belts. 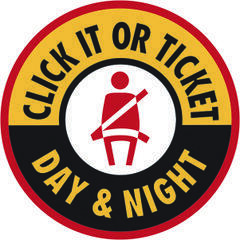 The nationwide Click It or Ticket campaign will run from May 21st to June 3rd. According to the National Highway Traffic Safety Administration (NHTSA), 10,428 people who weren’t wearing a seat belt were killed in vehicle crashes in the United States in 2016. "It only takes a few seconds to put on a seat belt," said Sheriff Bill Gore. "Making sure you're buckled up is the single most effective way to stay alive in a crash." Be aware that deputies are ALWAYS looking for drivers who aren't following California's seat belt laws. The Sheriff's Department issued 213 seat belt violation citations in 2017. In 2016, deputies issued 246 citations. Anyone caught not wearing their seat belt will be cited. A first offense will cost you around $162 and up. Remember to always wear your seat belt. CLICK IT OR TICKET! Funding for the seat belt enforcement campaign is provided by a grant from the California Office of Traffic Safety (OTS) through the National Highway Traffic Safety Administration (NHTSA).